I still saw quite literally LOADS of birds, but no ringed ones. In contrast to 24 hours previous a good couple of hours yielded no decorated wader legs. Plenty of Knot still around and a doubling in the numbers of Black-tailed Godwits boded well, but I drew a blank. Up to 200 Barwits was an excellent number for Thurstaston at this stage of the winter, which still feels Spring-like albeit with a cool sharp edge to the east wind that has blown up overnight. Trouble was they were all too far off to see well enough to check for rings so they were counted instead. The Redshank were close enough to run off a few frames. 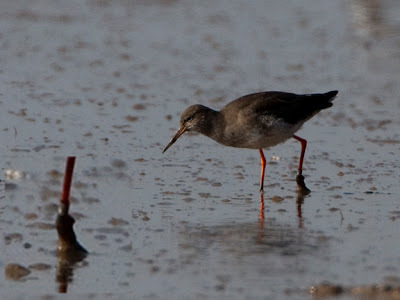 I have probably been a bit guilty of ignoring this species recently, concentrating instead on the Knot and Blackwits. So I spent a little time watching them catching small worms in the gloop and photographing their antics. On closer inspection it appears I did connect with a ringed bird. Take a close look at the bottom of the bird's left leg and notice the silver BTO ring at the bottom of the tarsus. I've enlarged the bottom portion of the leg to make it clearer. The tide has dropped quickly with the easterly behind it and there is a huge area of mud for the birds to disperse over. This makes counting tricky, but the birds decide to make it easy for us by forming into a huge flock and wheeling around. This doesn't seem to be due to any raptor, but they obviously perceive a threat. It's another special show over the flats with a huge number of birds involved. 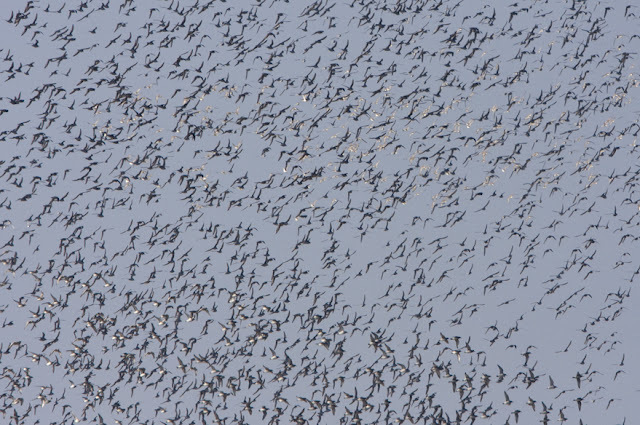 We estimate about 20,000 individuals in the flock and watch for a while, transfixed by the aeriel throng. It occurs to me that we are watching pure mathematics at work here. So many individuals flying so quickly in a roiling, changing formation with no crashes or collisions. This is due to the birds judging distances from near neighbours and maintaining that space during the flight. The birds are calculating complicated equations in split seconds and reacting just as quickly. I never thought I'd be impressed with algebra. I'm planning an early trip to the flats tomorrow to try and get the birds on the rising as opposed to falling tide of todays adventure. 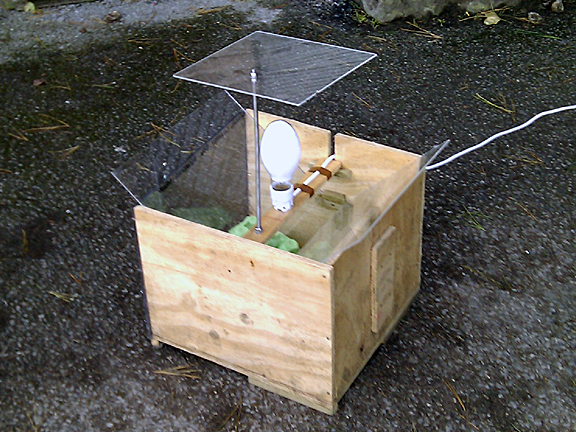 I'll be searching for rings, but not before I check the mercury vapor moth trap I've set.